Yuki Onodera was born in Tokyo (1962). In 1993, she established a studio in Paris and began to work internationally. Onodera’s experimental work, which does not fit within schemas of “photography,” often poses two questions: what is photography, and what can be done through it? She uses any possible method to realize her works, whether this means taking photographs with a marble inside her camera, or creating a story out of a legend and traveling to the ends of the earth to shoot it. Onodera is known for making two-meter-high prints in the darkroom, painting on her photographs, and for other original hands-on methods. Her work is held in collections around the world, including those of Centre Georges Pompidou, San Francisco Museum of Modern Art, The J. Paul Getty Museum, Shanghai Art Museum and The Tokyo Metropolitan Museum of Photography. 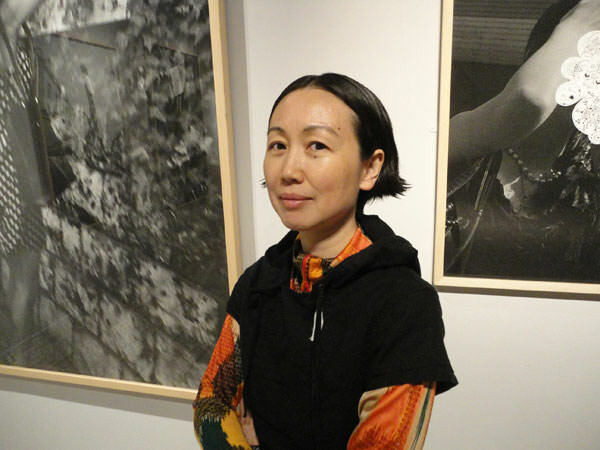 Among other locations, her solo exhibitions have been held at The National Museum of Art, Osaka (2005), Shanghai Art Museum (2006), The Tokyo Metropolitan Museum of Photography (2010), The Museum of Photography, Seoul (2010) and Musée Nicéphore Niépce, France (2011). 2011 Received “Award of Ministry of Education and Culture”, Japan. 2011 Received “The Higashikawa Award- grand prix”, Japan. 2006 Received “Prix Niépce”, France. 2003 Received “Ihei KIMURA Prize”, Japan. 2002 Received “Photographic Society of Japan”, Japan. 2001 Received “The Higashikawa Award- young artist award”, Japan. 1996 Received “The 21st Kodak Prize of Critical Photography”, France. 1991 Received “The 1st New Cosmos of Photography Award”, Japan. Kyoto Museum of Photography, Kyoto, Japan. 2018 “Incognito : Eye in Search”, Singapore International Photography Festival, Japan Creative Centre, Singapore. “A beautiful moment / Japanese Photography”, Huis Marseille Museum for photography, Amsterdam. “The Myriad Forms of Visual Art :196 Works with 19 Themes”, The National Museum of Art, Osaka, Japan. “Come Back! Retour à la Photo”, Galerie de l’Etrave- Espace d’art Contemporain, Thonon-les-Bains, France. “Paris c’est Elles”, La Boîte 31 de Marie-Ange Guilleminot, Paris. “Tan /110th Anniversary : Memorial Exhibition”, Art Gallery of Takashimaya, Tokyo. and Tokyo Metropolitan Teien Art Museum, Japan. 2009 “Elles@centrepompidou, “Musée national d’art moderne, Centre Pompidou, Paris. “Paysges de la Conscience”, International Photography Biennale, “Museo de Arte Moderno de Bogotá, Colombia. “Ce qui est à voir est ce que vous voyez”, Rencontres d’Arles 2009, Arles, France. “Indizien”, Galerie baer I raum f aktuelle kunst, Dresden, Germany. “Never Late Than Better”, Elizabeth Foundation, New York. “Warm up”, Minsheng Art Museum, Shanghai, China. “The Photograph’s Enticements to the Brush”, Ofoto Gallery, Shanghai, China. “Japan meets China”, Tochigi Prefectural Museum of Fine Arts, Utsunomiya, Japan. “Face à Faces” organized by Culturesfrance, The State Museum of Contemporary Art, Thessaloníki, Greek. “Booth 67f”, Van Zoetendaal collections, Amsterdam. “Be Quiet”, M50 Creative Space, Shanghai. “Incheon Art Platform Opening Exhibition”, Incheon Art Platform, Incheon, Korea. 2008 “Collection 3/ Aspects of Portrait”, National Museum of Art, Osaka, Japan. “Indefinite Beauty”, White Factory, Shanghai, China. “Verticals”, Van Zoetendaal collections, Amsterdam. “Face à Faces” organized by Culturesfrance, la Silom Galleria, Bangkok, Thailand. “The history of arts and cities-Paris, New York, Tokyo and Shanghai”, Sendai Mediatheque, Japan. “Chasseurs de beauté”, Gallery 21, Tokyo. “7 Views Toward the World”, Gallery Touchart, Heyri Art Valley, Korea. 2007 “Japan Caught by Camera”, Shanghai Art Museum, Shanghai, China. “Convection”,Three Shadows Photography Art Centre, Beijing, China. “Photographie: Détrônera la Peinture”, Musée Nicéphore Niépce, Chalon-sur-Saône, France. “Face à Faces” organized by Culturesfrance, Akureyri Art Museum, Reykjavik, Iceland. “7ème Biennale d’art contemporain”, Issy-les-Molineaux, France. “Japanese Contemporary Art Festival”, Heyri Art Valley, Korea. “Die Liebe zum Licht”, Museum Bochum, Bochum, Germany. “Figures of Thinking”, Chicago Cultural Center ,Chicago, Illinois, USA. “Fascination”, Takashimaya X Gallery, Tokyo. 2006 “Les Peintres de la Vie Moderne”, Cente Pompidou, Paris. “Die Liebe zum Licht”, Kunstmuseum Celle, Celle, Germany. “Out of Ordinary / Extraordinary”, Centre de la Imagen, Mexico. “Collection four”, The Museum of Modern Art, Gunma, Japan. “Die Liebe zum Licht”, Städtische Galerie Delmenhorst, Delmenhorst, Germany. “Figures of Thinking”, McDonough Museum of Art ,Youngstown, OH, USA. “Seeing the Light”, Carl Solway Gallery, Cincinnati, OH, USA. “Face à Faces” organized by Culturesfrance, City Art Center, Edinburgh,UK. “Taille Humaine”, Sénat et Orangerie su Luxembourg, Paris. “Face à Faces” organized by Culturesfrance, Fotografins Hus, Stockholm, Sweden. “Quintessence”, l’Ecole des Beaux-Art de Nîme, Nîme, France. 2005 “Life Actually”, The Museum of Contemporary Art, Tokyo. “Out of Ordinary / Extraordinary”, Sala de arte y cultura de Caja Canaria de la Laguna, Canaria, Spain. “Out of Ordinary / Extraordinary”, Centre Culturel “Les Chiroux”/ Institut Lambert Lombart, Liège, Belgium. “Face à Faces” organized by Culturesfrance, Artcurial, Paris. “The Children’s hour”, Museum of New Art, Pontiac, Michigan, USA. “the photography beyond 20 years from Tsukuba Museum of photography 1985”, Sendai Mediatheque, Japan. “Out of Ordinary / Extraordinary”, The Japan Cultural Institute in Rome, Italy. “Out of Ordinary / Extraordinary”, Museum fuer Ostasiatische Kunst, Berlin. “Figures of Thinking: Convergences in Contemporary Cultures”, Richard E.
Peeler Art Center, DePauw University, Greencastle, IN, USA. “How Photography Changed People’s Viewpoint”, The Tokyo Metropolitan Museum of Photography, Tokyo. “36 Photographers of the Kimura Ihei Award 1975 – 2005”, Kawasaki City Museum, Japan. 2004 “Roppongi Crossing – New Visions in Japanese Contemorary Art 2004”, Mori Art Museum, Tokyo. “Mask of Japan”, Guangtong Museum of Art, Guanzhou, China. “Out of Ordinary / Extraordinary”, The Japan Cultural Institute in Cologne, Germany. “beyond paradise”, Galerie Hengevoss-Duerkop, Hambourg, Germany. “Apparently Light / European Image Weeks”, Galerie Nei Licht, Dudelange, Luxembourg. “Out of Ordinary / Extraordinary”, Casa Asia Headquaters, Barcelona, Spain. “No Body’s Fool No Body’s Hurt”, Aura Gallery, Shanghai. 2003 “Ihei KIMURA Prize”, Minolta photo space, Tokyo and Osaka, Japan. “Mask of Japan”, aura gallery, Shanghai, China. “The New Cosmos of Photography”, Kaigandori Gallery CASO, Osaka, Sendai Mediatheque, Sendai, Japan. “Mon Paris”, Galerie 21, Tokyo. 2002 “Illusion”, Lunds Konsthall, Lund, Sweden. “Illusion”, Museet for Fotokunst, Brandts klaedefabrik, Odense, Denmark. “Illusion”, The County Museum of Jonkoping, Jonkoping, Sweden. “Illusion”, Midlanda Konsthall, Timra, Sweden. “Illusion”, Bomuldsfabriken Kunsthall, Arendal, Norway. “Illusion”, The Finnish Museum of Photography, Helsinki, Finland. “Photography in Japanese Contemporary Art”, Latvian Museum of Photography, Riga, Lettonie. “l’Inauguration de la Galerie RX”, Galerie RX, Paris. “Paroles de Fringue”, Bourgoin-Jallieu Museum, France. “The Built and the Living /European Image Weeks”, Galerie Nei Licht, Dudelange, Luxembourg. “Prize of Photographic Society of Japan”, Fuji Photo Salon, Tokyo. “The New Cosmos of Photography 10th Anniversary”, The Tokyo Metropolitan Museum of Photography, Tokyo. 2001 “Illusion”, Culture Center, Stockholm, Sweden. “Higashikawa Photo Fiesta”, Culture Center, Higashikawa,Hokkaido, Japan. “Contemporary Photography II”, Nikon Salon, Shinjuku, Tokyo. “Off Triennale-Zeit-Foto”, Ryunichi Kantonn Kaikan, Yokohama, Japan. 2000 “Zeitgenössische Fotokunst aus Japan”, Hallescher Kunstverein, Halle, Germany. “An Incomplete History”, University Art Gallery University of Massachusetts Dartmouth, Massachusetts, U.S.A.
“Zeitgenössische Fotokunst aus Japan”, Museum Bochum, Bochum, Germany. “Zeitgenössische Fotokunst aus Japan”, Badischer Kunstverein Karlsruhe, Karlsruhe, Germany. “Mois de l’Image”, Centre d’Art s Plastiques Albert Chanot, Clamart, France. “Contemporary Photograpers of Japan”, Shanghai Sanya Photograph Gallery, Shanghai, China. 1999 “Internationale Fototage Herten”, Herten, Germany. “Zeitgenössische Fotokunst aus Japan”, NBK ( Neüer Berliner Kunstverein ), Berlin. “An Incomplete History”, Houston Center for Photography, Houston, Texas, U.S.A.
“About Leaving Home”, Centre d’art Contemporain, Saint-Priést, France. 1998 “Photobiennale’98”, Art Media Center-TV Gallery, Moscow. “Medialogue – Photography in Japanese Contemporary Art ’98”, The Tokyo Metropolitan Museum of Photography, Tokyo. “Jeux de genres ; from recently collection of Fonds Municipal d’Art Contemporain Paris, “Espace Electra, Paris. Visual Studies Workshop, Rochester, NY, U.S.A.
“Le donné, le fictif”, Centre National de la Photographie, Paris. “Narrative Art from the Collection”, Tochigi Prefectural Museum of Fine Arts, Utsunomiya, Japan. “Between Water, Air and Earth”, Galerie Vrais Rêves, Lyon, France. “21st Anniversary Zeit-Foto”, Artspace Shimoda, Tokyo. 1997 “Floating Images of Women in Art History”, Tochigi Prefectural Museum of Fine Arts, Utsunomiya, Japan. 1996 “Sosie”, Sagacho Exhibit Space, Tokyo. “6ème Festival International de la Photographie de Mode”, Centre Bellevue, Biarritz, France. “21st Kodak Prize of Critical Photography”, Galerie Passage de Retz, Paris. “Premier Salon des Artistes Naturalistes”, Le Mois de la Photo, Muséum National d’Histoire Naturelle, Paris. “Oiseaux”, Le Mois de la Photo, Galerie Pierre Brullé, Paris. 1993 “Avant-Garde Photographers of Japan”, Space for Cultures Seihin, Taipei, Taiwan. 1992 “The 1st New Cosmos of Photography”, P-3 Art and Environment Gallery, Tokyo.